The Interstate Commerce Commission approved the merger on September 13, 1960, and on October 17 the Erie Railroad and Delaware, Lackawanna and Western Railroad merged to form the Erie-Lackawanna Railroad. The EL struggled for most of the 16 years it existed. The two railroads that created it were steadily losing passengers, freight traffic and money; and were heavily burdened by years of accumulated debt and extensive, money-losing commuter operations. These two historic lines, the Erie and the DL&W, started to consolidate facilities on the Hudson River waterfront and across southern New York State in 1956, four years before formal corporate merger. The Lackawanna route was severely affected by the decline of anthracite and cement traffic from Pennsylvania by the 1940s. The Erie was burdened by the continuing loss of high-tariff fruit and vegetable traffic from the western states into the New York City region as highways improved in the 1950s. Both lines were also affected by the opening of the Saint Lawrence Seaway in 1959, which allowed ocean-going cargo ships to travel between European, African and South American ports and cities on the Great Lakes, such as Buffalo, Cleveland, Detroit, Duluth, Chicago, etc. The DL&W had previously carried much traffic to and from ocean ships, having its own port facilities at Hoboken Terminal on the Hudson River. The northeast's railroads, including the EL, were all beginning to decline because of over-regulation, subsidized highway and waterway competition, commuter operations, and market saturation (i.e., too many railroad lines competing for what market was remaining). The closure in the 1960s of old multi-story factories in the eastern cities, followed by the decline of the domestic automobile and steel industry in the 1970s, eroded much of the EL's traditional traffic base. Also, due to government regulation policy formulated in the late 19th century, the EL and other railroads could not immediately abandon long-distance passenger runs, despite the fact that competition from airlines, bus lines and the private automobile made them unprofitable. However, the EL did post profits in the mid and late 1960s through heavy cost-cutting (reduction of parallel services), equipment modernization, suburban industrial development, increased piggy-back trailer traffic, and steady reduction of long-distance passenger train service, which ended on January 6, 1970. Also, additional rail traffic was temporarily diverted to the EL because of service problems on the troubled Penn Central lines, which the EL largely paralleled. The EL built a state of the art diesel engine repair facility in Marion, Ohio, and upgraded a large car repair shop in Meadville, Pennsylvania. 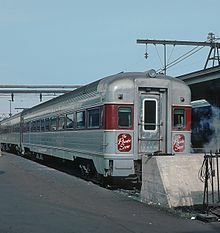 As to its money-losing suburban passenger train services in the New York City metropolitan region, the EL had come to terms with the state of New Jersey during the late 1960s for adequate subsidy and for the purchase of new engines and coaches. The EL also gained a lucrative contract with United Parcel Service in 1970, which led to the operation of five dedicated intermodal trains daily between New Jersey and Chicago. The Erie Lackawanna Railway was formed March 1, 1968, as a subsidiary of Dereco, the holding company of the Norfolk and Western Railway, which had bought the railroad. On April 1, the assets were transferred as a condition of the proposed but never consummated merger between the N&W and Chesapeake and Ohio Railway. Dereco also owned the Delaware & Hudson Railway at the time. After its 1972 bankruptcy, EL management attempted to plot an independent course, anticipating financial reorganization without a heavy debt burden. Therefore, it initially declined interest in joining the Consolidated Rail Corporation (Conrail) takeover of the other major bankrupt eastern lines. The preliminary (PSP) and final (FSP) system plans for Conrail showed the EL being merged into the Chessie System. Also, by 1975 the economy in the eastern United States was gravely affected by the 1973 oil crisis, quashing any hopes of the EL being able to independently compete with government-rehabilitated Conrail lines. Therefore, the EL petitioned and was accepted into Conrail at the last minute. In 1976, much of the company's railroad assets were thus purchased by the federal government and combined with other companies' railroad assets to form Conrail. An independent Erie Lackawanna Estate continued in existence for several years thereafter. This estate liquidated the EL's marginal non-railroad assets and distributed the railroad purchase funds to satisfy much of the large debt burden that the EL and its predecessors had accumulated. The EL's creditors gained more by selling the line's assets than by continuing its traditional business operations. Remaining passenger service in the 21st century consists of commuter train operations, including joint Metro-North and NJ Transit operation of the Port Jervis and Pascack Valley Lines and NJ Transit's Boonton, Morristown and Gladstone Lines. Track reconstruction is underway that could restore regular service along the Lackawanna Cut-Off on the New Jersey frontier with Pennsylvania and extend service into northeastern Pennsylvania, possibly as far as Scranton. Nos. 1 and 2, Phoebe Snow, New York (literally, Hoboken)-Chicago; discontinued November 27–28, 1966. No. 7, Pacific Express, No. 8 the Atlantic Express; discontinued in August 1965. Nos. 5 and 6, Lake Cities, discontinued January 5–6, 1970. No. 10, New York Mail; No. 15, Owl; discontinued May 23, 1969. Nos. 1301 and 1306, Interstate Express, pool train with B&O, Reading, CNJ railroads from Washington, D.C. to Syracuse, via Philadelphia, Wilkes-Barre and Binghamton; discontinued between 1954 and 1961. Nos. 1903 and 1906, Hoboken-Scranton-Binghamton-Syracuse service, discontinued by 1954. Nos. 28/29, Cleveland-Youngstown commuter trains; discontinued January 14, 1977. Though operated by Conrail after April 1976, they were the last remnant of EL passenger trains outside the New York-New Jersey commuter zone. These trains used the same EL locomotives and coaches formerly used on through line passenger trains. Nos. 623, Morning Steel King, and 624, Evening Steel King, pool train with NYC, P&LE and B&O railroads, from Toledo to Washington, D.C., via Cleveland, Youngstown and Pittsburgh; discontinued by mid-1960s. EL operated an extensive commuter rail system in the New York Metropolitan Area that was conveyed to Conrail and has been owned and operated by New Jersey Transit and Metro-North Railroad since 1983. The Erie-Lackwana-Hoboken-Terminal features in the film Three Days of the Condor, the filming site where the characters played by Robert Redford and Faye Dunaway part for the final time as he catches a train to the Washington D.C. Capitol region. In September 2015, Norfolk Southern revealed its EMD SD45-2 numbered 1700 painted back to its Erie Lackawanna color scheme at Chattanooga, Tennessee. This is the second unit from an NS predecessor painted back into its original colors. ^ Gunnoe, Chase (2015-09-30). "NS repaints Erie Lackawanna SD45-2 in original colors". Trains Magazine. Retrieved 2015-11-22. Grant, H. Roger (1994). Erie Lackawanna: The Death of an American Railroad, 1938-1992. Stanford, California: Stanford University Press. ISBN 978-0-8047-2357-2. This page was last edited on 8 March 2019, at 14:38 (UTC).